The second day of the Interventional Orthopedics Foundation Conference didn’t disappoint on scientific content, but for me as an outgoing founder who was welcoming a new president, it was a special event. 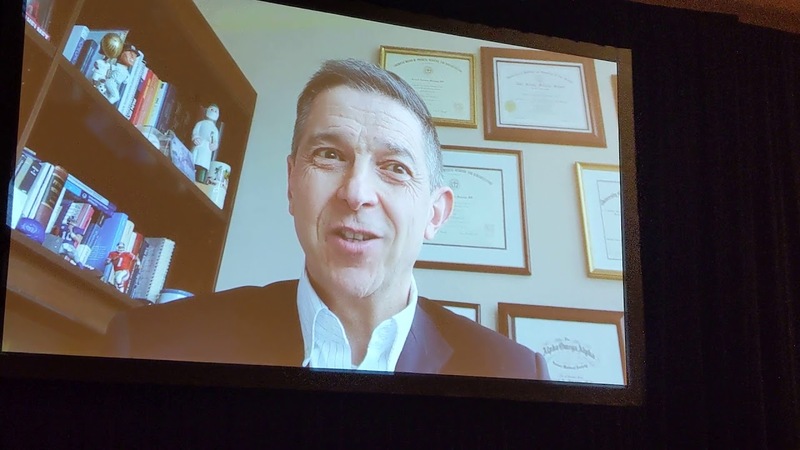 Above is a video I took when they surprised me with a ceremony to thank me for all of my hard work in creating the field of interventional orthopedics. How do you start an entirely new medical specialty that can successfully compete head-to-head with orthopedic surgery and offer a less invasive alternative? In 2014 it was clear that what we were doing at the Centeno-Schultz Clinic and at several Regenexx sites around the U.S. was something completely different. For example, while there were many people who could just inject something into a joint, placing stem cells into a specific tear in the anterior medial bundle of the knee ACL or the superior labral anchor of the shoulder required training and expertise that just didn’t exist. There were no textbooks at that time on how to do these things, there were no residency programs, and outside of a few fellowship slots around the country where some of this was taught, this knowledge couldn’t be easily accessed. We had a great educational program at Regenexx where you could learn these things as part of the internal courses that we taught to our network physicians, but those were closed to the outside world. I was taking flack at that point from my colleagues who felt that too much about what we knew in Regenexx wasn’t open source. Hence, by 2014, I began to feel that they were right. If the medical specialty that I was calling interventional orthopedics was ever to be properly birthed, it needed to have an organization that could teach these complex image-guided injection procedures. At that point, I had already forged a relationship with local billionaire philanthropist John Malone. I knew that John was a big believer in regenerative medicine and wanted his philanthropic donations to make a difference. Hence, I pitched John on the idea that we needed funds to begin to build this new medical specialty, and he responded with a several-million-dollar grant that would allow us to get up and running. While we had slide sets for our Regenexx training curriculum, they needed a refresh and a much more thorough build-out. In addition, after teaching a few courses, I turned the didactic lecture for each course into several videos that the physician could watch on his or her own time and then paired that with a hands-on cadaver course. I then added in a written test and we were off. Our dance at that point was that our new executive director, Nancy Ho, would come to me a month before we offered a new course and then I would get busy on the course materials. I would get them done within one or two weeks of the new event, and then we would repeat the whole thing the following month. It was an incredibly busy year and a half with hundreds of hours spent building the new interventional orthopedics curriculum. With John Malone’s generous gift, we were able to build an infrastructure and even a classroom site. However, we needed a place to perform these cadaver courses, and the problem was that any place that rented this type of facility was tens of thousands of dollars per event. That was more than we collected from students for these events, thus we would be eating into precious capital that needed to last us a long time. Hence, I volunteered my clinic, which was big enough and had the right equipment to allow these courses to happen. Through the years, our fellowship program at Centeno-Schultz Clinic (CSC) became a ready source for both students and then instructors for the courses as did my partners at CSC. We then added in select Regenexx network physicians and others to instruct, and we slowly built a second-to-none course infrastructure. Still, to this day, there is nothing that even comes close in course content and quality. We held our first annual conference in 2015. This was a stressful affair as we barely had 90 attendees. The room we were packed in at the Omni Hotel was so tiny that I recall asking Nancy Ho to open the divider to the next room, which gave us more space, but also made 90 people look like a much bigger crowd. My wife has a great term that she uses with our kids—”adulting.” Meaning, starting to give them the ultimate responsibility for their lives. For me, this all began with what I called my “hit by a bus” plan. Meaning, I needed to allow others to teach IOF courses and to begin taking over the day-to-day running of the organization so if I were accidentally “hit by a bus,” IOF would survive me. This past year at the 2018 conference, it became clear to me that I needed to take the final “adulting” step with IOF. As one person I could only take the organization so far, and it needed new leadership with different ideas to reach out to different groups of physicians. Hence, I tapped Gerry Malanga, MD, and Rahul Desai, MD, to be its first official president and president-elect. After that, the organization would have to figure out how to figure it all out. 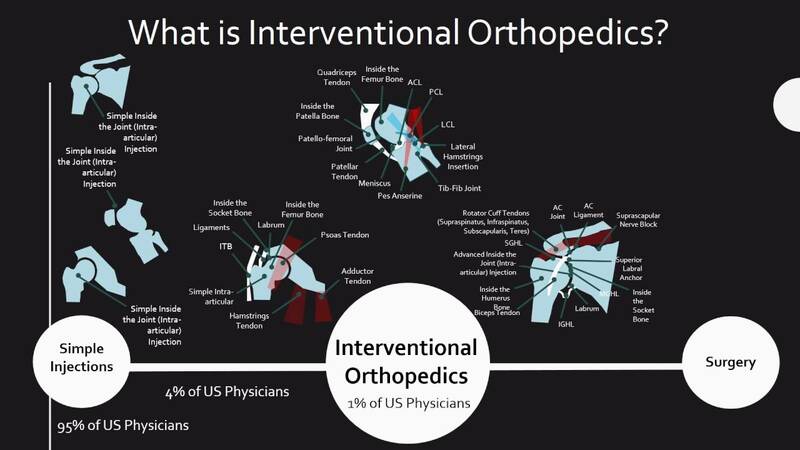 Fast forward a couple of years and thousands of hours of my time and the immense quantity of time put in by many others, and the Interventional Orthopedics Foundation is now the premier educational nonprofit in the orthobiologics field. It teaches hundreds of physicians a year at monthly courses, and its annual conference is fast becoming the top orthobiologics event in the world. So there I was, sitting there on the second day of that conference, exhausted from a few days of not enough sleep but satisfied that I had turned over the reigns to Gerry Malanga, when I got a big surprise (the video above). I thought about getting a clean copy of the video with better sound from IOF, but I kind of like the off-the-cuff nature of me whipping out my cell phone camera and asking myself, What the heck is this? Was this on the agenda? Suffice it to say that I was very honored to be honored by all of my colleagues. They even gave me a great clock with an inscription, which may be the modern version of my gold watch at retirement. So many thanks are needed. Thanks to John and Leslie Malone for providing the fuel that made all of this work. Thanks to both of our executive directors of IOF, first Nancy Ho and then Jillian Abramson, who have been the people tasked with building what I envisioned and making it all real. Thanks to our dedicated board members, Wayne McIlwraith, Greg Lutz, Don Buford, and Richie Striano. Thanks to Gerry Malanga and Rahul Desai for seeing the vision and imbibing it. Thanks to all of our doctors and fellows who have been the ones teaching the courses these past few years. Thanks to that second generation of instructors who were birthed by the first, and now to the third generation of dedicated teachers. All of these professionals take time away from their practices and weekends to make this field happen. Thanks to all of the people behind the scenes at these courses and conferences who keep the lights on and make the events work smoothly. I’ll start wrapping this up this morning with a story of what happened at the conference this week. A physician came up to me and tried to get me to allow his nurse practitioner into the IOF training programs. He was in a large orthopedics group, and their nurse did all of the injections. What I told him is the message that all of us now in interventional orthopedics must relay to our orthopedic colleagues. I said something like, “When you let your nurse do all of your arthroscopic surgery procedures, I’ll be happy to train her.” Meaning, what we do in IO is very complex image-guided procedural work that can be screwed up a hundred ways from Sunday, just like interventional cardiology or orthopedic surgery. It is not something to be delegated to a midlevel, but a medical subspecialty unto its own. The upshot? I’m up in the mountains relaxing after a crazy few days, but a crazy good few days. I am still humbled to be honored by my colleagues in this field, and now it’s time for the next group to come in and take IOF and IO to new heights with fresh ideas and perspectives. I am proud to be a pioneer, but like all good pioneers, I can see over the horizon to a day when my contribution will be ancient history and only a small part of interventional orthopedics circa 2040. That's the goal - Glad to help! Thanks, now get back to work!!!! Ps....you and Schultz have earned your "wings"
Yes, Dr. Centeno will continue everything, and some new things, except acting as president of the IOF. Couldn't earn their wings from a nicer guy - Thank you! What a great story. Congratulations and continued success! I learn so much about the entire medical field and industry from these blogs, not just on orthobiologics.